Barbara McDade, who has been director of the Bangor Public Library for 27 years, is retiring May 11. 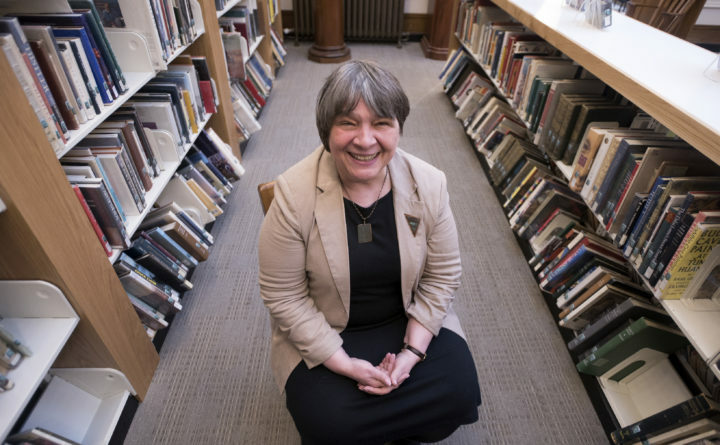 After 27 years as director of the Bangor Public Library, Barbara McDade will check her last books out to patrons on May 11, when she officially retires after a career in libraries spanning more than four decades. The new director, Ben Treat, a Brewer native who for the past nine years has worked as a director at the University of Maine at Augusta libraries in both Bangor and Augusta, will start his new job on May 14. The library went through an extensive nationwide search for a new director after McDade announced more than a year ago that she planned to retire in 2018. In the end, however, the library’s board members found the right person locally. Treat graduated from Brewer High School in 1994 and from Bates College in Lewiston in 1998, later attaining an M.S. in Library Science at Simmons College in Boston in 1999, and an M.A. in English from the University of Maine in 2017. Treat’s first job out of grad school was as a reference librarian at the Boston Public Library, a position he held for three years. He later was a reference librarian at Franklin Pierce University in New Hampshire, until moving in 2009 back to the Bangor area to become director of the newly-renovated Nottage Library at the University of Maine at Augusta’s Bangor campus. McDade, 67, said that the thing she’ll miss the most about the library is her daily interactions with patrons and with people who love books — but that she’s looking forward to, as she puts it, “taking a gap year” in her retirement. Over the course of her long career with the Bangor Public Library, she’s shepherded through a number of major changes. They include the transition from card catalogs and paper records to digital, which occurred in the 1990s and early 2000s, to two major renovations, including an $8.5 million renovation in 1996, and another in 2015 that cost $9 million and included the building of the new two-story glass atrium. Those transformations have turned the library into a hub for people of all stripes from all over the Bangor area, who want to read, research, learn, connect and even socialize. “We still have plenty of people whose primary interest is getting a good book to read, but the biggest difference, I think, is that we are not just a library anymore — we are a community center. It’s not just books, it’s so much more,” said McDade. An open house to celebrate McDade’s retirement is set for 2 to 7 p.m. May 10 at the library.